Tired of replacing the decorative lights? Decorative lights getting over heated? Having to take of the decorative lights in the rainy weather? Disappointed with the brightness of the lights? Worry about the plug quality issues? The LED string lights has a bad smells? Vilaka Plug in LED Twinkle String Lights is the solution of your problems! Waterproof LED String Lights not only can be used in indoor only, you need so liberate your sockets, but also comes at an irresistible price. They light your home at night and look fantastic. Perfect for Christmas, weddings, party, festival, garden, kicthen and etc. The new version has reduced bulky controllers. When you are using it outdoors, you only need to protect the plug. The plug are not waterproof. Please keep the connection slots away from water or high moistrue circumstances to avoid unexpected black-outs. 2018 New Upgraded Version! 8 Flashing Change Modes and Reduced Bulky Controller: combination, in waves, sequential, slogs , chasing/flash, slow fade, twinkle/flash, and steady on; The controller is in the plug. 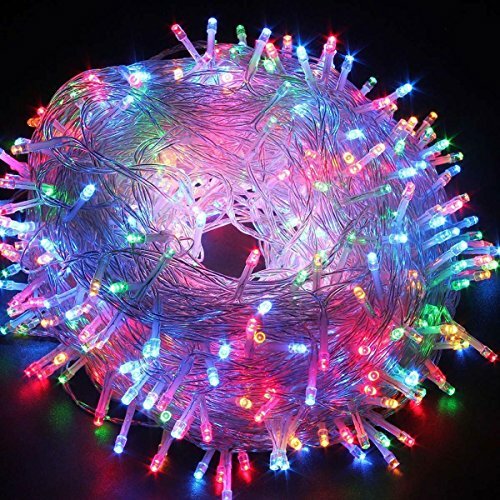 Vilaka 72ft Twinkle String Lights with 200 LEDs: Super long length and more light beads: 22m/72ft with 200 indivisual LEDs, will brighten up the dark corner for happiness atmosphere inside or outside. It is more brighter than other low tension powered lights, and safer than the high voltage lights. Easy to use: Safe 29V UL plug in string lights, directly plug in and unplug it for power on and off. UL Certificated Output and wire: 29V Voltage Safe LED Sting Lights with UL certified, leads to 29V safe output by UL plug-in transformer. Waterproof String Light: IP44 high waterproof rating; The Plug include control function, reduce bulky controller, the string lights are completely waterproof, only need to protect the plug. Perfect Decorative Lights: Suitable for indoor and outdoor decoration purposes in gardens, patios, Swimming Pool, Pergola, Terrace, Christmas Tree Decoration, entrances, New Year, Party, Birthday parties, weddingsetc. Decorate your party and events with flashing lights and put ordinary to extraordinary. If you have any questions about this product by Vilaka, contact us by completing and submitting the form below. If you are looking for a specif part number, please include it with your message.